I am currently on my second pair of these booties. They are the best ones I have found for dry, cold conditions. They are not waterproof. They go on and off fairly easily, but the bottoms connecting the openings between the cleat and heel is made of a pretty flimsy material which tends to get tears in it. 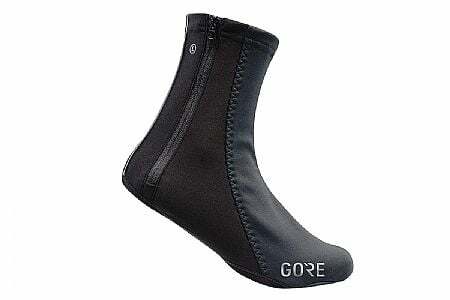 I used my first pair for an entire fall, winter, spring cycle on the dry days. Howver when I tried to put them on at the beginning of October this year the zipper on the right bootie separated. I felt that they were good enough to purchase them again for this year, hoping that they had improved the undersides. They didn't and by the second day I wore them they had once again developed tears. I suppose I could have returned them, but there really isn't a viable alternative that I have found, and so long as the zipper holds up they are fully functional. I ride every day, usually for 2.5 to 3 hours, so I have gotten a lot of use out of the booties. They aren't cheap, but until I find something better I will continue to use them and replace them with new ones whenever the old ones give up the ghost. These are relatively light (in weight and thickness) covers but so far they have been good down to the upper 30 F range on road bike rides. I now expect them to work in the lower 30F range, and perhaps lower on slower gravel rides. I bought the 42-44EU size and they fit nicely on my 42.5 and 43 shoes. Durability is still hard to judge since I've had them only a few months. I am pleased with the product.